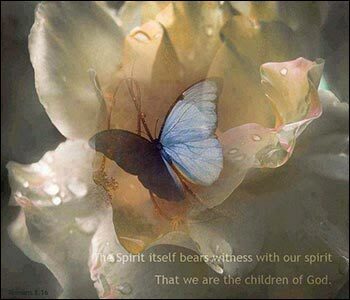 The Spirit Himself bears witness with our spirit that we are children of God, and if children, then heirs—heirs of God and joint heirs with Christ, if indeed we suffer with Him, that we may also be glorified together. In the preceding verses, Paul tells us that we can know we are God's children because our life begins to change; we take a new direction in many ways. This verse continues the theme of knowing we are God's children, but we look to a second indication; we have the witness of the Holy Spirit. But what does this actually mean? While we may feel in our hearts that we are God's chosen children, a feeling in the heart can be deceptive. We are given to sin, and especially pride, and we are tempted to give ourselves credit. So we must be careful about claiming spiritual proof of our salvation. Of course, it is also important to us in our faith to feel, in our heart, the love and fathership of God. We need and will receive comfort from the Holy Spirit. We know that we are going to suffer in the world, to some degree, for our faith. And this is a second test that we can use to determine the witness of the Spirit within us: how have we suffered, that we would not have done, from being a Christian? Most people are not going to be flogged bloody or crucified; and we do not suffer for the sake of suffering. Let's not go out and suffer intentionally! But we must not be afraid to be teased or looked down upon if we witness to Christ, as one example. We must not be afraid of losing a promotion because our boss hates Christians. And one might say that much thankless work — washing dishes, or dealing with difficult people, in order to help out with an event. These sorts of unpleasantness we can expect. And we are comforted in this life, directly by our prayer life, when the Holy Spirit will bring us relief from any pain we suffer; and most of all, by the joy of knowing that, as God's children, we are going to inherit an eternity of life and peace and wonderment, in the presence of God Himself. Lord, examine me, and let your Spirit testify that I am your child through the grace of Christ. Amen.